There aren't many traces left in the University District of the tumultuous early 1970s. Forty years have erased almost all of them. One exception is found on the northwest corner of W. 10th and Hunter, adjacent to 110 W. Tenth. 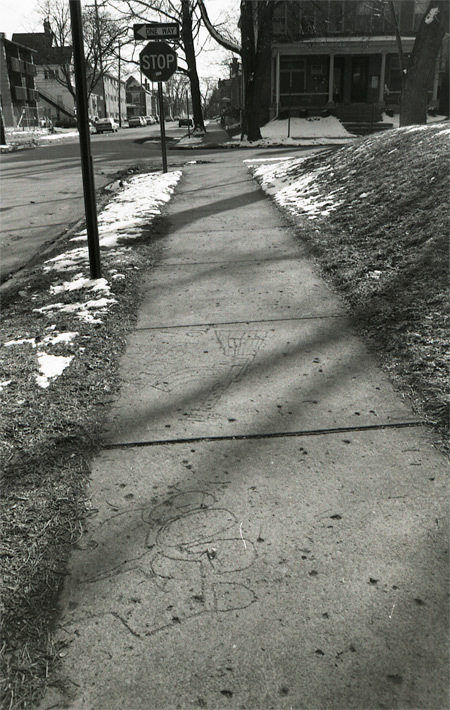 Sometime back in the very late 1960s or early 1970s, the city or a property owner poured a new sidewalk here. Before the concrete fully hardened, actual communists inscribed it with propaganda. By the time the damage was discovered, the concrete was hard and it was too late and too expensive to do anything about it. The communists hoped that Joe and Jill Average Student from Middletown would innocently stumble onto this graffiti, have their minds liberated, and be transformed into flag-burning, AK-toting disciples of Ho Chi Minh. Forty years have passed. The war ended. The US left Vietnam. Mao died and the Cultural Revolution ended. The Killing Fields of Cambodia erased whatever appeal the Maoist model held. The Cold War ended. The Soviet Union fell and took Marxism-Leninism with it. China embraced market reforms and became a global economic power. Vietnam itself embarked on the capitalist road. It now enjoys a booming economy and friendly relations with the United States. US stores are full of cheap Vietnamese manufactured goods while Vietnamese use Microsoft Windows, eat food grown in Iowa, use plastics from Texas, and watch Hollywood movies on DVD. 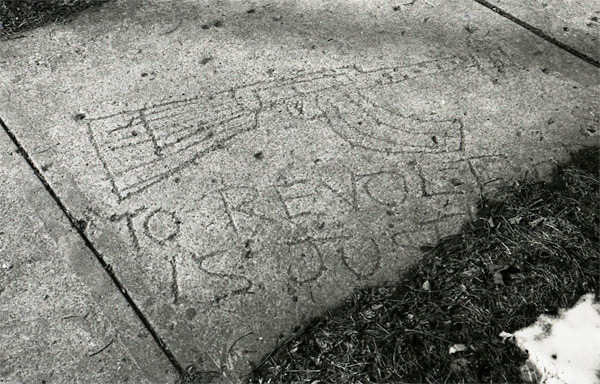 The Sixties radicalism that inspired this sidewalk graffiti seems quaint and a bit silly now, an odd fashion of a half-forgotten time, like beehive hairdos, Pop Art, or Day-Glo miniskirts. As for the communists who inscribed the graffiti... They probably grew out of annoying their parents and forsook Marx sometime in the 1970s, became yuppie mall developers in the 1980s, and now live in a gated community in Phoenix, playing golf, hating their grandkids' hip-hop music, idolizing the "greatest generation" parents they once despised, watching Fox News, and worrying about their prostates. A hammer and sickle? Really? Seriously? That's how you win friends and influence people? These Sixties communists were nothing if not naive. Hadn't they ever seen the kind of reception Ivan Koloff got at pro-wrestling events? Hadn't they ever heard The Beatles' "Revolution?" If you go carrying pictures of Chairman Mao, you ain't gonna make it with anyone anyhow. Scarcely more effective is the image to the left of the hammer and sickle. Just barely visible in this photograph is a Vietcong flag with the words "Victory to the NLF." The NLF was the National Liberation Force for South Vietnam. Called the Vietcong by US forces, the NLF was the communist insurgency battling to overthrow the South Vietnamese government and the enemy of US soldiers fighting in Vietnam. This looks to be a crude and incomplete rendering of an AK-47, AKM, or maybe an RPK-47 firearm. Hard to tell. All were common Vietcong weapons. Alongside it are the words "To revolt is just." The message is that armed revolt against the existing order is justified. With Soviet-manufactured weapons. Nearby is a clenched fist (visible in the first picture above). In the 1960s and early 1970s, the clenched fist was most strongly associated with black nationalist groups. It was prominently and controversially displayed by African-American athletes in the 1968 Olympics. Clenched fist iconography also figured in the Ohio State riots of spring 1970. It was the symbol used by the student strike campaign. This leads me to suspect that this graffiti was probably made sometime close to the riots. Long Live the Victory of People's War was an article written by Lin Biao in 1965. He was a prominent Red Chinese general and Mao's second-in-command until his mysterious death in a coup attempt in 1971. Lin Biao's article generalized from Mao's strategy of protracted people's war in China and called for communist revolutions in Asia, Africa, and Latin America to surround, undermine, and eventually bring down the capitalist countries and usher in global communism. Blending Third World anti-colonial struggles with Marxist revolution and an implied racial struggle, People's War hit all the right notes for Sixties radicals. Sixties radicals were already massively in love with Red China anyway. It wasn't, however, all that well known. The average student, even the average demonstrator, would probably have been unaware of it. 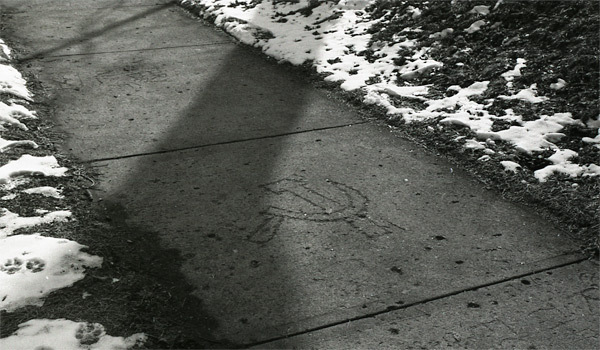 These sidewalk-defacing communists were the real deal. They knew their stuff. For all that, I doubt their propaganda ever changed a single mind, much less transformed Joe and Jill Average Student into Buckeye Che Guevaras, ready to take to the Hocking Hills. 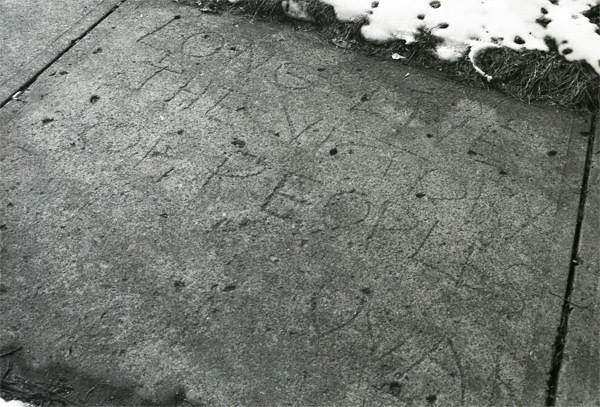 Forty years after its creation, the sidewalk graffiti has faded considerably. Weathering and erosion have nearly erased it. Scores of people walk over this sidewalk everyday without noticing any of it. These pictures were taken in 1996. The graffiti is much less legible today. Two panels, one beginning "Revolution is the..." and another proclaiming "Avenge Da..." (Dan? Dave? Dale?) have become almost completely unreadable. Still, if you happen to be there on a sunny day, preferably as the sun is just starting to sink in the west, you can yet see some of this legacy of the University District in the 1960s. UPDATE: Sidewalk repairs in November 2010 have taken out two panels of the revolutionary sidewalk graffiti. Most remains intact for now.